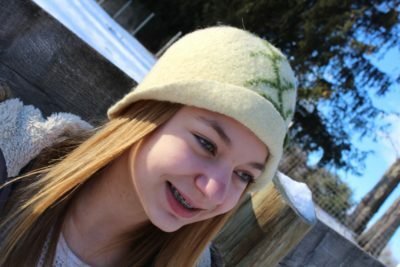 Adorable cream colored wool hat made by fiber artist Fazilet Akman. This one of a kind hat can be used with a casual or dressy jacket. Love the vine detail on the front – it adds just the right amount of color to the design. It is sweet enough for a younger person yet sophisticated enough for the young at heart. Either way it is a winner. 2019 Lilymoore Farms LLC All rights reserved. Only service dogs are allowed on the farm. Please keep other pets at home.